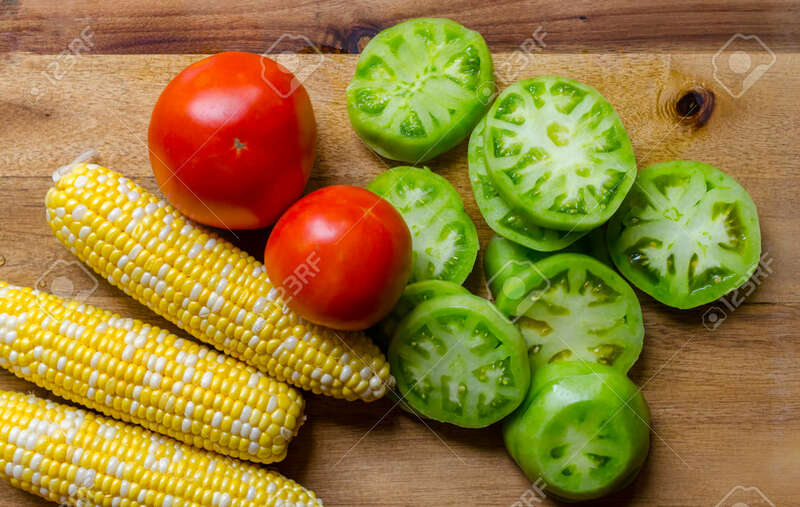 Fresh Homegrown Organic Vegetables Including Corn, Tomato And Sliced Green Tomato. Ripe, Juicy And Delicious Produce Ready To Prepare For A Healthy Satisfying Nutritious Meal. Lizenzfreie Fotos, Bilder Und Stock Fotografie. Image 114070582. Standard-Bild - Fresh homegrown organic vegetables including corn, tomato and sliced green tomato. Ripe, juicy and delicious produce ready to prepare for a healthy satisfying nutritious meal. Fresh homegrown organic vegetables including corn, tomato and sliced green tomato. Ripe, juicy and delicious produce ready to prepare for a healthy satisfying nutritious meal.